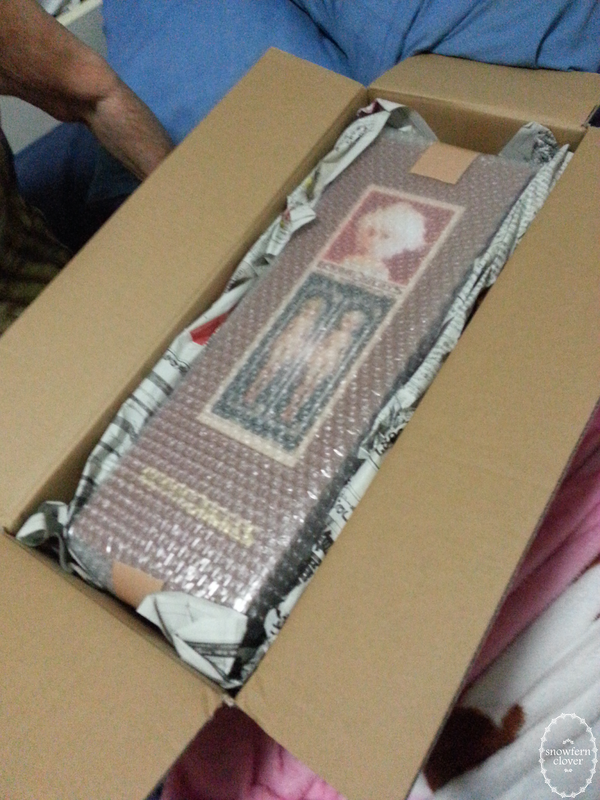 And so.....on March 31st, Saffron arrived! This will be a lengthy and picture heavy post, so I'll divide it into 4 parts - Box Opening, Faceup, Sewing her first outfit, and Review. There was an accompanying note explaining why she was strung! 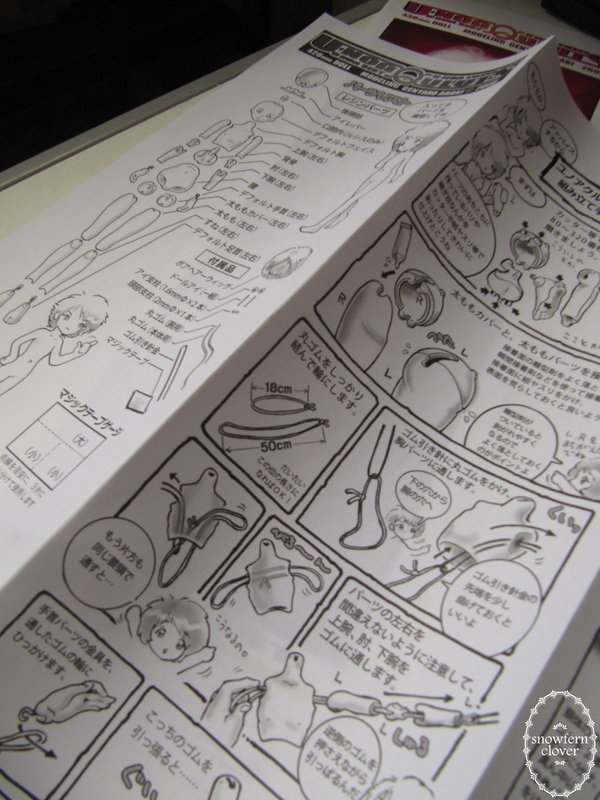 Although the instructions were in Japanese, there were enough illustrations to help with the re-assembly. 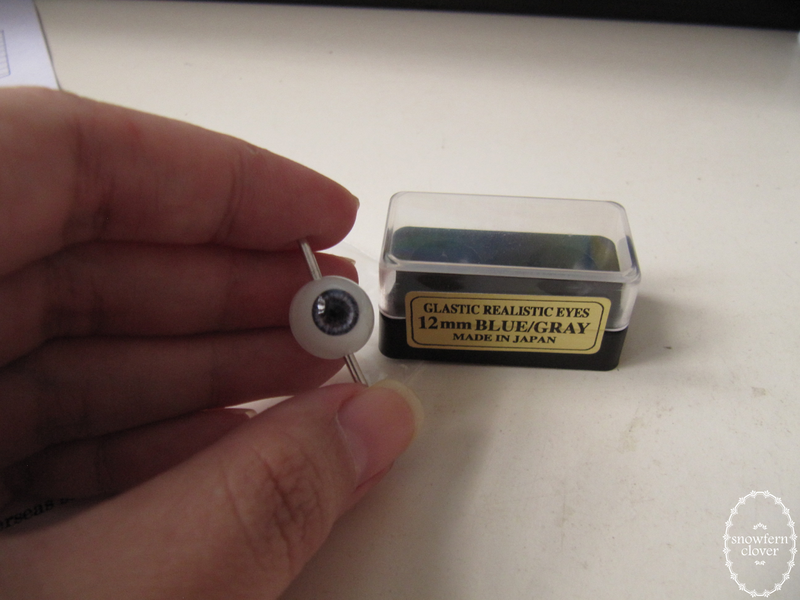 They are acrylic (I think) and have holes drilled for the eye mechanism. Will use them for Lusis! Sisters! 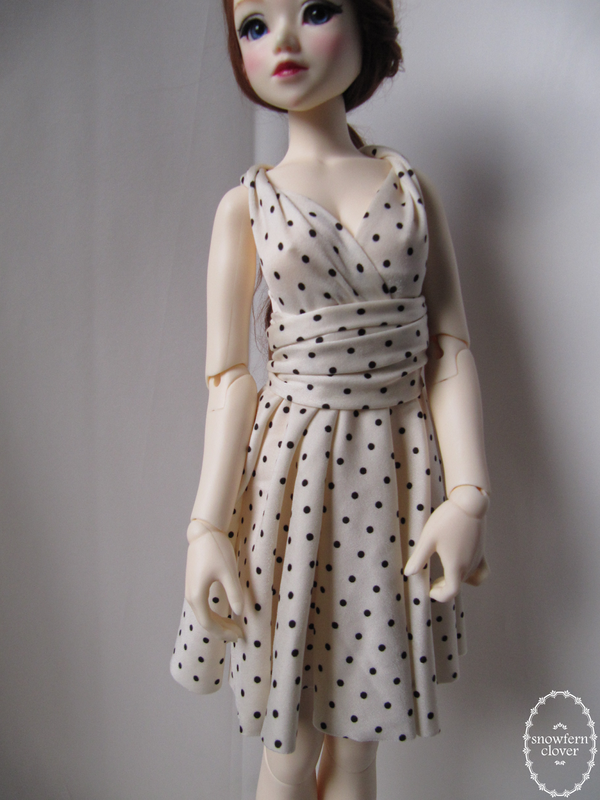 They're both 1:4 scale, or classified under Asian Mini/MSD sized dolls in DoA (I think). 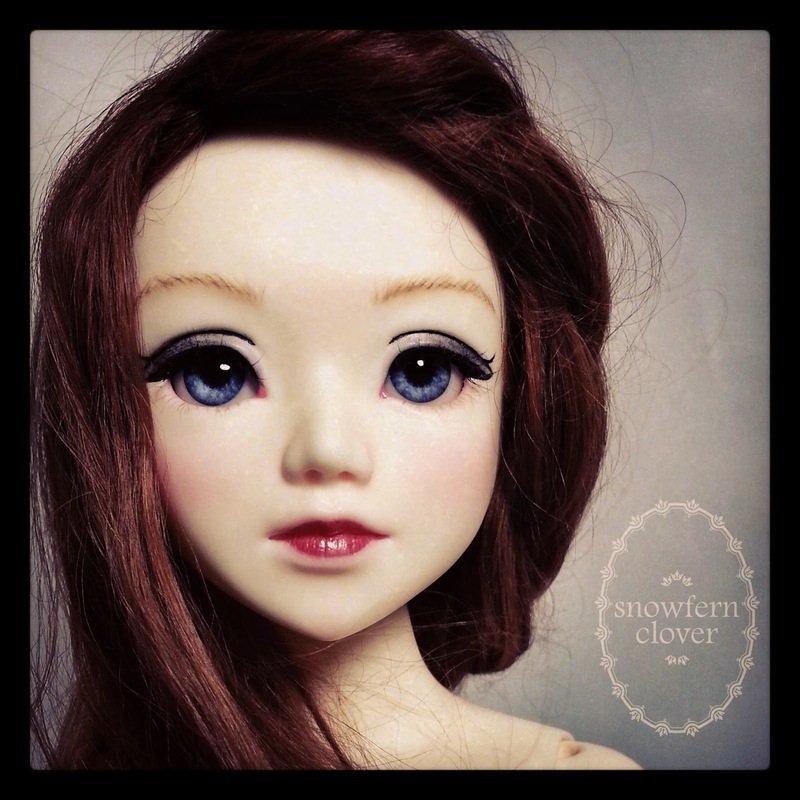 I coincidentally had 3 spare pairs of 12mm eyes which I had purchased for Clover, which were quickly put to use! The right most one is the Sist Decadent faceplate, I'm wondering if I can mod her into some cyborg type character....*taps chin*. Anyhow the 2 on the left are the Lusis Default and Wink faceplates. TOTES ADORBS. 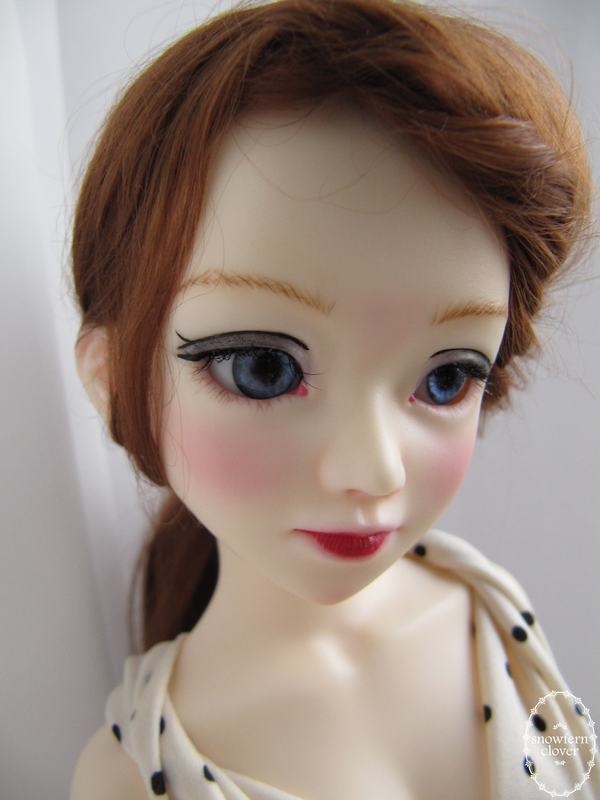 The doll also came with a faux fur (mohair?) white wig, which TBH I'm not too fond of, but maybe after some dyeing I can work it into something more appealing. 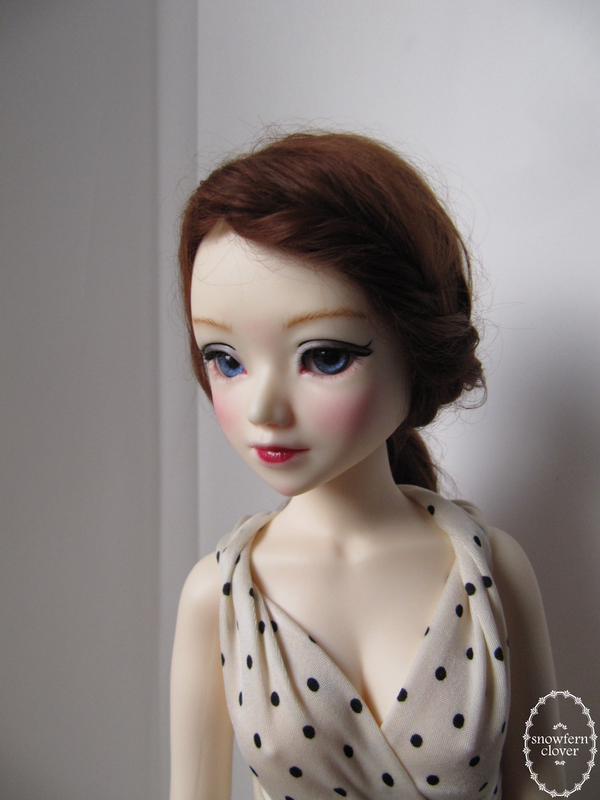 Oh and she's in her large bust option (purchased separately) in this photo :) Clover is enough of a tomboy for them both! As I was going to wash and re-string Saffron, I thought that Clover needed a bath too. I had made the mistake of spraying her body with MSC even though I had little-to-no-intention of body blushing her....so all I did was wet sand the more visible and sharp flash lines. I won't go into detail about my process as I've already documented it here, when I did Clover's face up. This was my 2nd attempt at Saffron's face, the first one was so disastrous I had to clean it off, and re-start the whole process the following day. 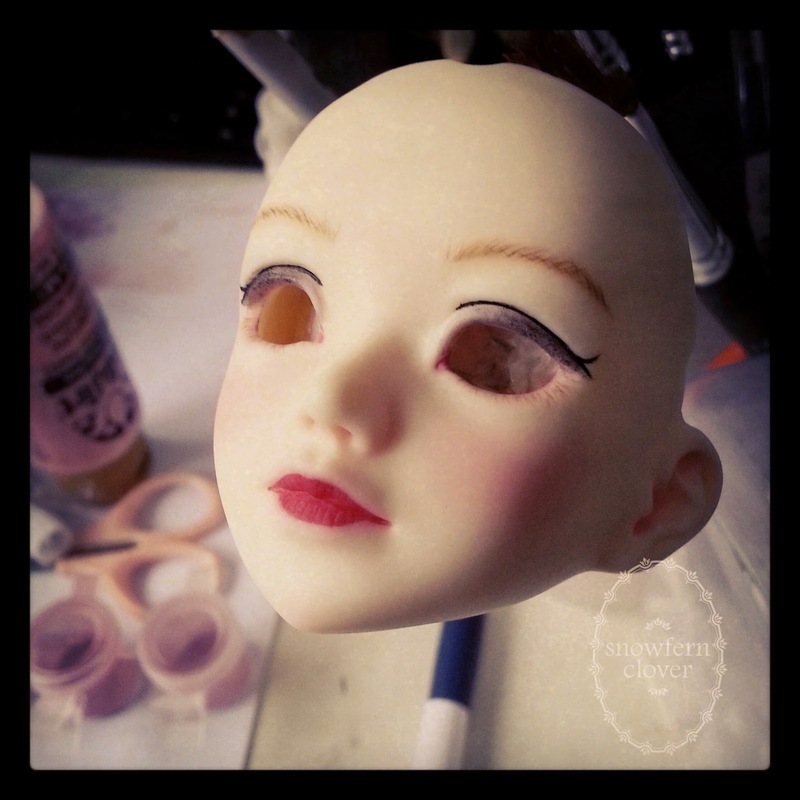 4 hours down the drain (stayed up till 3am the first try) T-T But I'm glad I didn't settle for an inferior face-up...because I am totally loving her current look! She looks so different from different angles! 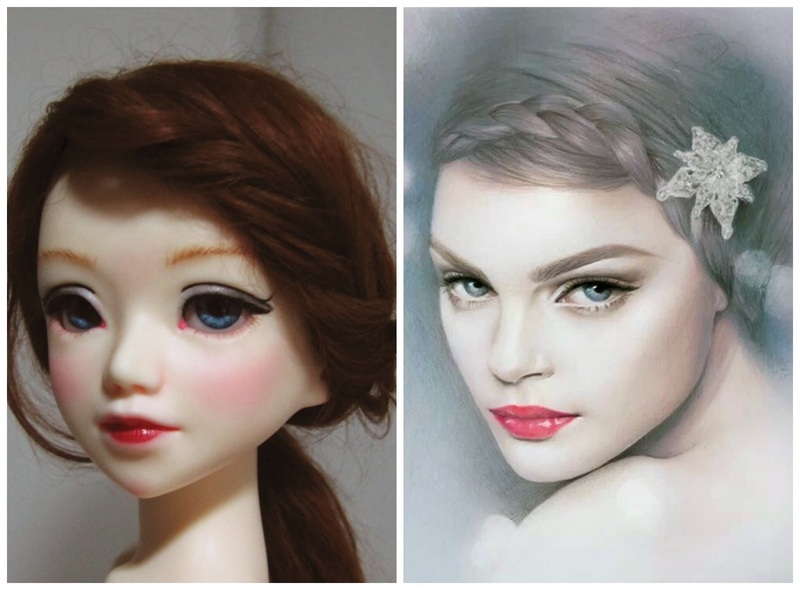 So where did inspiration for her faceup come from? I had come across this photo in my facebook photostream on a random day...and immediately knew this was how I was going to style her. 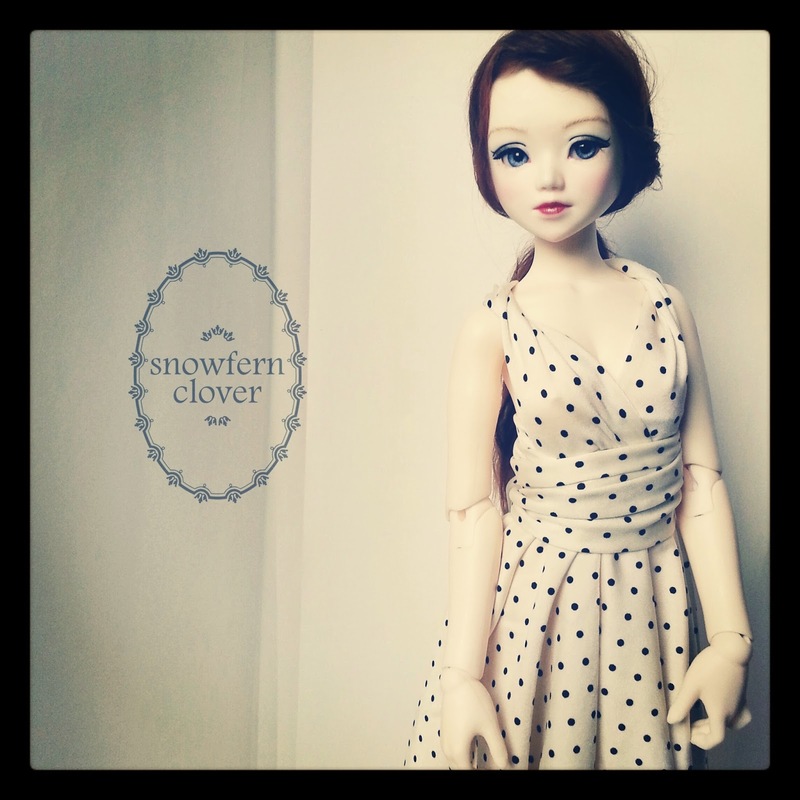 I opted to go for a friendlier eyebrow shape and keep the red-head tone as she's Clover's sister after all. And at around the same time I had read that blue eyes + red hair is the rarest combination for redheads, so it all worked out great! The wig is an old one I made and as Clover's head is a little larger, I temporarily stuck doublesided tape to hold it down (NOT RECOMMENDED but eh I'm not selling her and I know how to handle tape residue :X) I'll be making a new wig specifically for her but I'm really partial to this combination now. Eyes were the default that came with Clover, and I don't feel brave enough to drill holes in it, so they're held in place with blu-tack. 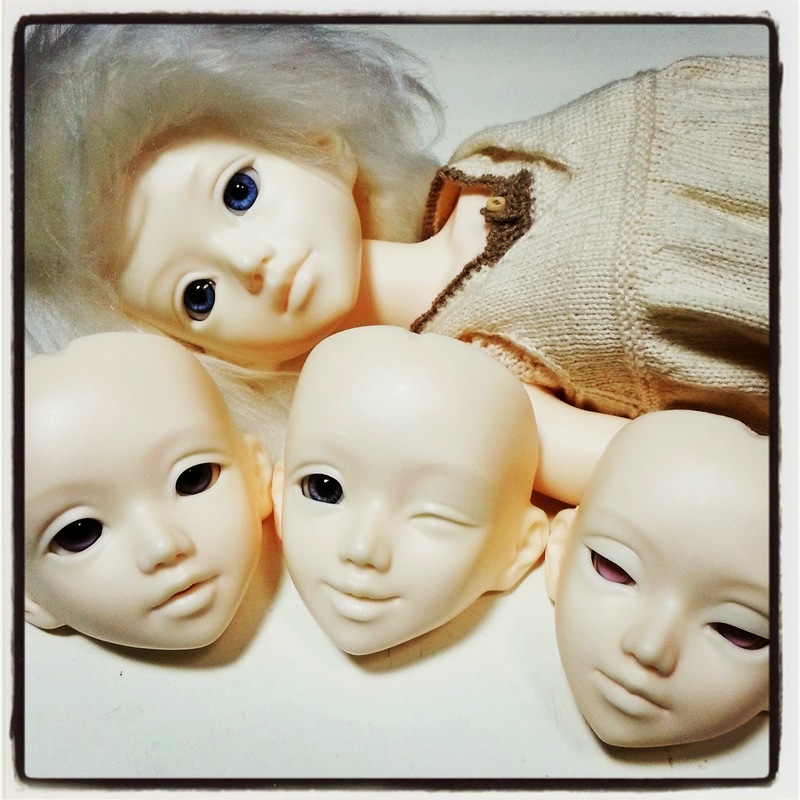 I want to emphasize that this is not recommended if you're intending to do professional grade face-ups, but since I have no intention of selling my grail doll, I'm quite happy to experiment and in any case, these face plates are far more affordable and replaceable so I'm not too bothered. I was also careful to keep the line gentle, so that there's more of a subtle transition than a harsh red outline which happened on my first attempt. 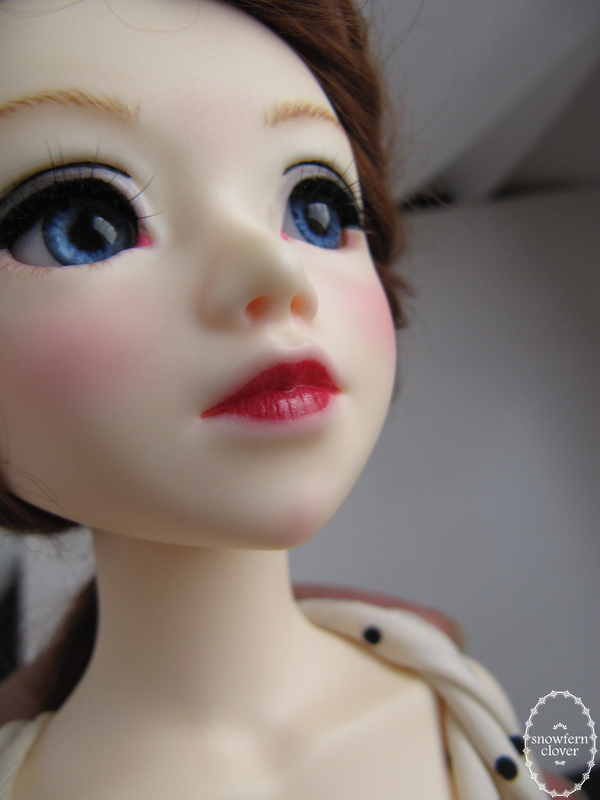 As to the brushes, I used the same ones in the faceup for Clover. For the eyebrows, they were done differently than Clover's, I painted in the individual hairs...and although it was tempting to sand off the eyebrows in the sculpt, it actually served as a good guide and provides more dimension, so I left it in. This time round, the only reference I used was the Bec Winnel artwork, so the whole process was much faster, though it did take about 3 hrs the 2nd time round. I had subscribed to a thread on DoA in which Silver Identity had kindly created a tutorial with measurements catered to a MiniFee. Thank You! (haha I don't think he/she reads my blog but yeah, I appreciate it!) I know that some of you have mentioned that it's difficult to get on DoA, and personally I've been having issues with accessing except on my mobile, so I can't fetch the link either...but there are soooo many infinity dress tutorials out there so just do a quick search on DoA or Google and you should be golden. 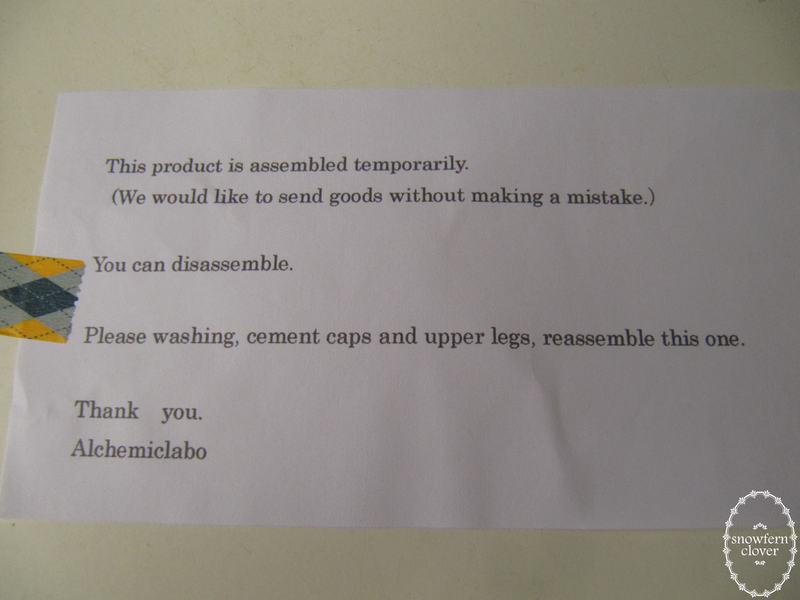 I won't post the instructions here out of respect for the thread starter's hard work, but you can figure it out pretty easily from the online tutorials and adapt accordingly. I whipped this out in less than 1 hr. 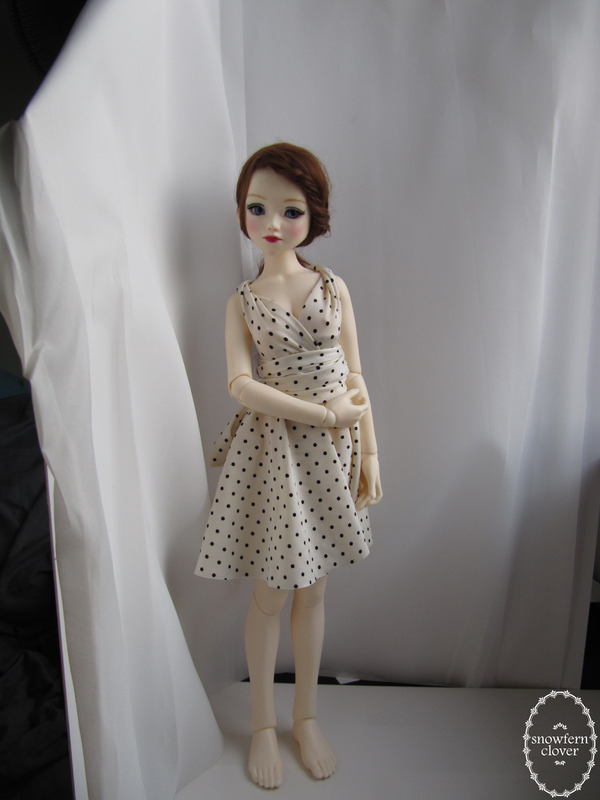 The jersey knit material was a half-yard that I purchased at Chinatown early last year...I loved how thin it was and it draped beautifully, so I knew I could make a beautiful dress out of it....a no-brainer why I used it for this dress! I am quite busy, what with having to think about wedding preparations, flat stuff, commissions and a TOP SEKRET PROJEK (haha I'll reveal that in due time of course!) but I get teased quite a bit by Asuka and the fiance for dressing Clover in "auntie" or "office lady" style clothes so it was IMPERATIVE that Saffron have something more suited to her! Okay! PHEW. I hope you enjoyed this post, please comment to let me know it was worth all my hard work! p.s. 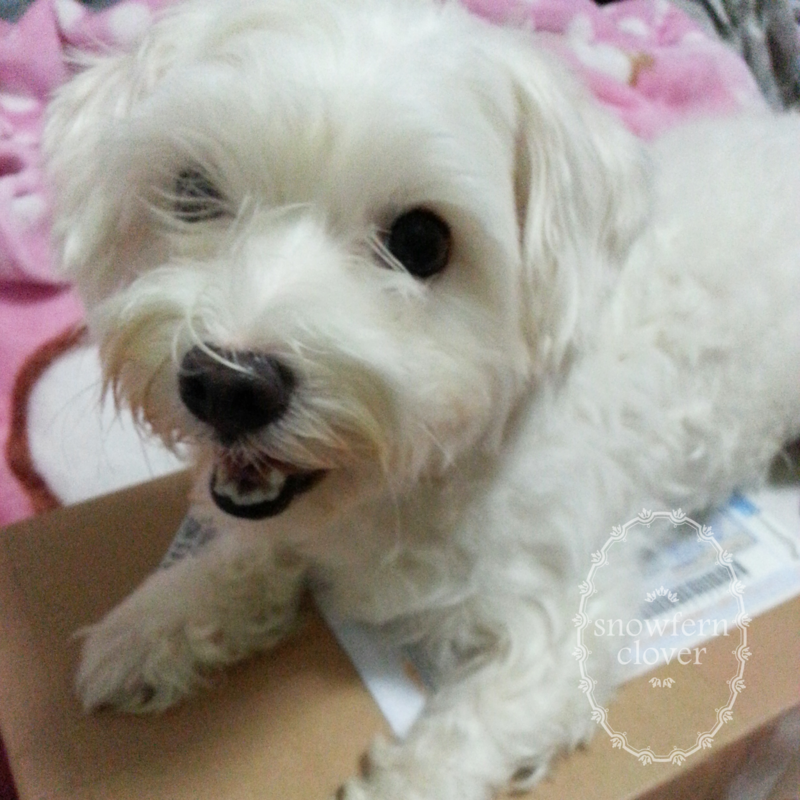 I named her after my favourite character in "Absolutely Fabulous". That, and as Asuka pointed out, Clover-tea and Saffron-tea works perfectly together!